I want you to meet someone who is writing her memoir. Are you interested? Now you should know that I am always interested in people writing. As a publisher you have to keep your eyes and ears open for the unexpected—the jewel that could amble or bump into your office disguised as a dilettante or a computer programmer or a doctor or a teacher. So I always say yes, to meeting any writer. Suda, whom I knew years ago, met me and told me he knew someone who had lived a long life and was writing her memoir. Ok, I said laconically, I will meet her. She is quite old, he warned me, well in her nineties, you will have to go to her. No problem, I said. And so it was a morning of 2006, Sam and I found ourselves at Coniston Place in front of two very special people – Christine Wilson and her husband Alistair. While she was immaculately dressed, complete with pearls, Alistair came in a pair of shorts. We sat at the table on the verandah, overlooking the beautiful front garden that revealed fragments of Wycherley looming on the other side of the lane, accompanied by the manic barking of Jenny the rescued pariah dog, and were handed a big file with a sheaf of papers. Here you go, she said, my writings. Read through them and tell me what you think. After a sumptuous mid morning snack and repeated offers of sherry, which we politely declined at that time, but at later meetings accepted with alacrity, we went back to the office. I began reading and I was hooked. Here was a person who was born almost a hundred years ago, and went literally from lamplight to electricity. Christine’s memoir may not have been completely accurate, but then again, that is the difference between memoir and autobiography. But it was a wonderful portrait of a society in a period of time that was just about to go through a violent change. Reading her life story brought home to me, born approximately fifty odd years later, that not only Sri Lanka, but the world has changed vastly – not always for the worse, not always for the negative, and it charts a difference that literally rocks your world. Against the sky of a hot December morning the mast of a strange sailing vessel rocked gently. Below the bow a carved floral panel carried in weathered white letter, Mohideen Idroos. For us, my father, mother and me, there was a palm-thatched cabin amidships lined with white calico where we arranged our camp beds. Today, there is talk of a vast road being built through the Wilpattu sanctuary that could change the eco-system of the area. Christine would be horrified. Wilpattu was close to her heart. Given a choice, she would rather be there than in Colombo. Whenever I visited her and told her I was going camping or to Yala, she would wistfully say, that she wished she could come with us. Her daughter Anne, wrote to me a few days ago and told me that Christine expressed a wish to come with her to Yala when she visited this April. Such was her spirit! I on the other hand, wished that I had known her when she was younger, feisty and a pioneer and role model for women. For Christine, gender didn’t seem to be a barrier, she was tom-boy, adventurer, pretty girl and socialite, painter and writer all at the same time. Before the war she lived on tea plantations by herself. After her divorce and during World War 2, she worked towards the war effort and met Alistair, a Scots serviceman, the love of her life whom she later married. Together with her father she worked with the Veddahs, she lived in Scotland and later in Kenya with Alistair, then both of them came back to Sri Lanka after retirement and while writing, conducted tours of the jungles to create awareness of the wonderful eco-system that our country possesses. Of course by the time I came to know Christine in person, she wasn’t living this life but had meticulously documented them in her memoir. While we were working on her memoir, Christine was frantic that it should come out soon, as she might not live to see the book in print. So we worked on it, doing overtime and having many meetings and discussions. Always at the verandah table, always accompanied by Alistair. And eventually in January 2007, we had a launch at the Dutch Burger Union on a Saturday morning. My greatest sadness was that Alistair was too unwell and therefore unable to come to the launch that he so wanted her to have. After the launch, Christine, her daughter Anne and her husband Henning, Suda, Smriti Daniel, Sam and myself went to Coniston Place and shared a bottle of champagne with Alistair who was overjoyed at the success of the launch, even though he could not attend. Five months later Alistair passed away. Christine was devastated. When I fell ill, Christine who had just lost Alistair monitored my progress closely with weekly calls to Sam and generous baskets of fruit, flowers and other gifts to keep me occupied and cheer me up. After my recovery, whenever I visited her, she would always be far more concerned about my health than her own failing health. She would hold my hands lovingly and tell me that I must get better, that I must live. That she would not have it any other way. Sam’s and my visits to Christine were also a step back to another way of life. From the moment we entered Coniston Place, it was an entrance to an era that no longer existed outside. Sometimes I would take my mother with me to visit her and once my sister came and both Christine and Anne exclaimed on how like Anne she looked, another time a friend who is an architect and who is passionate about the environment had wanted to meet this great and exceptional woman. Even at her weakest, Christine would be beautifully dressed, sometimes waiting for us, sometimes walking slowly towards us using her walker. We would sit together and not five minutes later be offered a glass of wine or sherry. Sometimes we would refuse, it being ten or eleven in the morning, other times we accepted and she would sip her drink with us companionably, chatting about her past, chatting about her next book. We dreamt together of doing a book of photographs – her photographs of the other love of her life – the Veddah people. She had the most magnificent photographs that I have seen and it would be a pity if nothing came of it. They are photographs that deserve to be shared. Christine you are now united with Alistair – you are home. But Sam and I will miss you. Christine Spittel Wilson, the famous daughter of Dr. R.L. Spittel, passed away on the 26th of February. She is the author of a dozen books including CHRISTINE – a memoir. 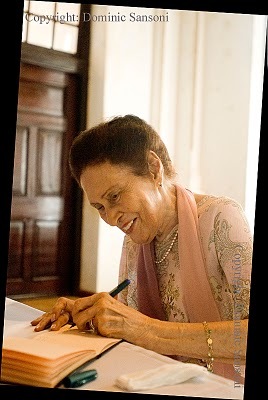 Christine Spittel Wilson, a Perera Hussein Publishing House author passed away the last week of February. 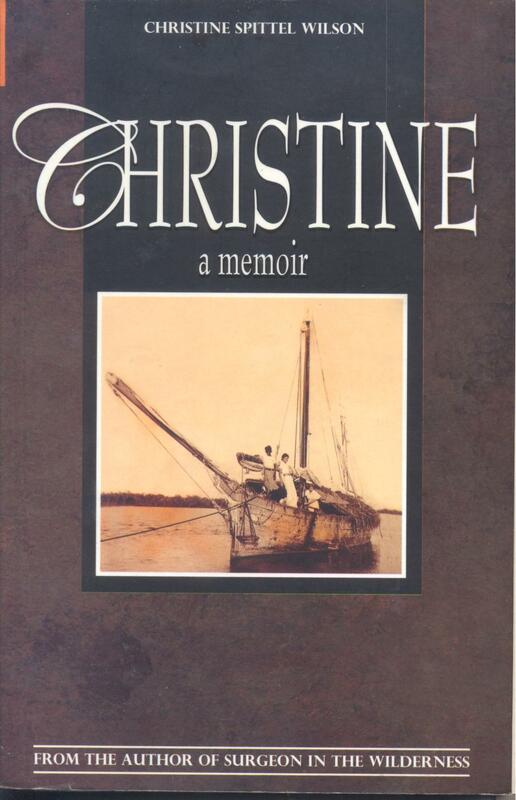 She had published more than eleven books internationally and her memoir Christine was released in 2007. The photograph was taken by Dominic Sansoni at the launch.